Chicago Pneumatic is offering CVW readers the chance to win a 24V ultracapacitor jump starter. Not only does Chicago Pneumatic have innovative tools in its vehicle service range, but it also has a wide variety of workshop and garage equipment. The company recently introduced its latest piece of garage equipment for the commercial vehicle sector, and it has proved popular since it was revealed at the MECHANEX show at Sandown Park last November. The CP90600 24V jump starter will be on display once again at the forthcoming CV Show on CVW ’s stand, 4A66, where visitors will have the opportunity to enter the competition to win this illustrious prize! The CP90600 with ultracapacitor technology can jump start a flat battery within seconds. It delivers a high starting power of up to 16,000A (for 12V) and 8,000A (for 24V) to jump start cars and many commercial vehicles. This ultracapacitor jump starter is equipped with an alert to prevent polarity inversion, and a fuse to protect both the product and the vehicle. Once the flat battery is up and running again, the ultracapacitor technology recharges fast on the running engine, with a charging time of less than 30 seconds. 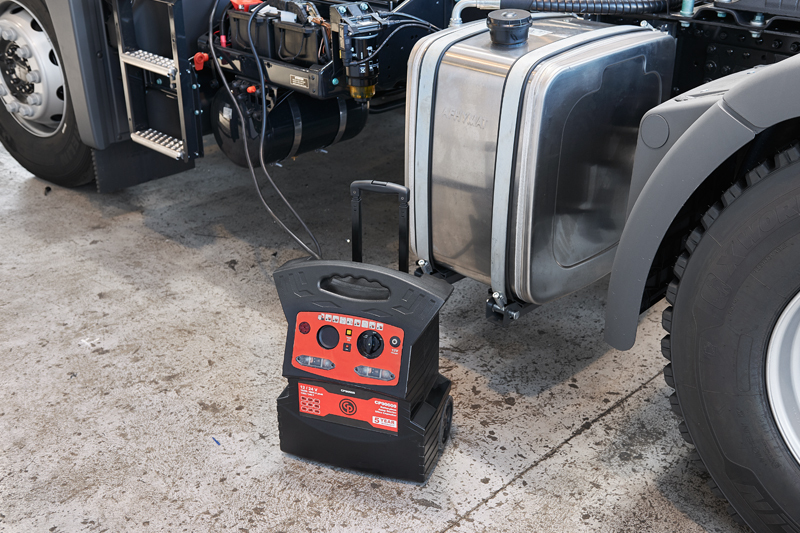 Around 20% lighter than traditional lead- acid batteries for easier and more comfortable transportation, the jump starter is supported by a five-year guarantee for up to one million cycles. Fused to protect the vehicle and the booster from improper use, it is user friendly with easy reading and voltage information. This lightweight and comfortable unit uses an on/off button and a voltage selection, as well as having full electrical insulation for protection from electric arcs during set-up. Durable with large copper clamps and 50 mm2/0.48 in2 cables, it offers double polarity protection. This new edition is suitable for commercial vehicles, and joins the existing CP90250 and CP90500, which also deliver a high starting power of up to 9,000A at their peak. These innovative starters are a welcome addition to any workshop or garage. What stand number is CVW at this year’s CV Show? You can also enter by visiting the CVW stand at the CV Show. This competition is run in association with Chicago Pneumatic and open to trade only.